I first got wind of Mo' Bettahs (multiple locations, mobettahs.com) when my wife talked about how trendy their Bountiful location is among her high school students. It wasn't long after that conversation that I started seeing the Hawaiian grill pop up everywhere—in the 10 years since the first location opened its doors, there are now seven restaurants spanning from Lehi to Logan. It's no surprise that a place like Mo' Bettahs caught on in Utah. The portions are huge and meaty, and its famous macaroni salad takes a page right out of the mayo-centric Mormon cookbook. All the same, two questions about Mo' Bettahs rack my brain: How exactly did brothers Kimo and Kalani Mack manage to open a new restaurant nearly every year since 2008? And why do cops and firefighters religiously flock to the place? Answering the first question is easier than the second. Part of the restaurant's success comes from the Macks' outlook on entrepreneurship. The siblings grew up in Oahu, Hawaii, and have let their laid-back, free spirit guide their path. Focusing on the food that made them happiest in their youth (hint: it ain't salad), the brothers launched a steak shop that soon embodied the coastal vibe in their DNA. With the help of Four Foods Group, a local company that helps develop up-and-coming restaurants into franchises, Mo' Bettahs has experienced nothing but growth since 2008. Although the partnership with Four Foods has helped spread the word, I can't help but think there's something Faustian about such a sweet deal. Mo' Bettahs in Bountiful started from humble origins and had a bit of an edge, truth be told. Now, its crisp branding and streamlined fast-casual service make it feel like it's lost a bit of that indie flair. Then again, perhaps I'm overthinking it—who am I to complain about more access to grilled meats in my hometown? Regardless of street cred or mainstream popularity, a restaurant still lives and dies by its food. Mo' Bettahs has figured out what it does well, and sticks faithfully to that playlist. Leave your hoity-toity, white linen expectations at the door; you're here to feast. The menu is tailor-made for diners after gigantic, carnivorous portions and is known for its distinct lack of anything resembling a vegetable. Teriyaki steak, katsu fried chicken and kalua pork represent the foundational trinity of meats that defines Mo' Bettahs cuisine. A tip for first-time diners: Underestimate how hungry you are before ordering. 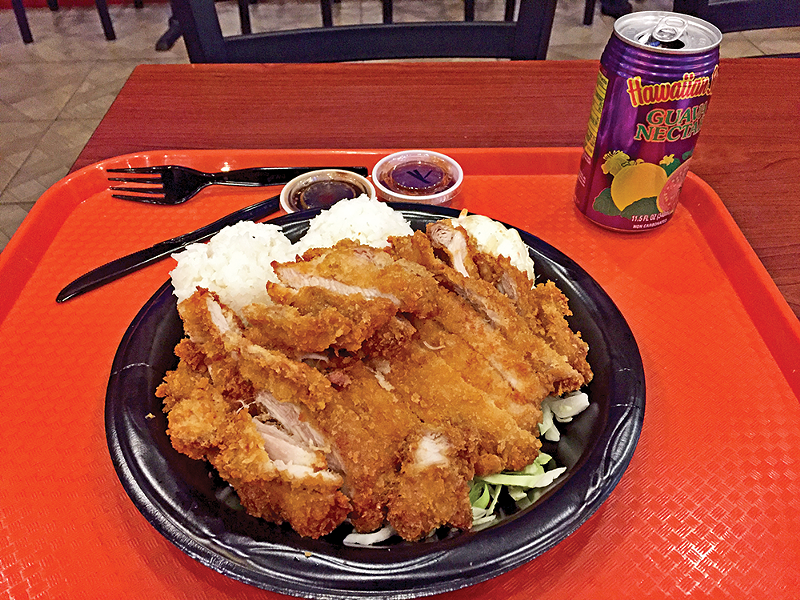 The mini katsu chicken ($6.99) for example, consists of two large chicken breasts, battered and fried in crispy katsu fashion, served with softball-sized scoops of rice and macaroni salad—it's anything but mini. I'm a fan of katsu chicken, and Mo' Bettahs' interpretation is tender, juicy and nicely crunchy—most of the time. On occasion, the dish can be inconsistent—meat on the dry side is my most common gripe. For diners seeking the full effect, the mixed plate is a good option. The mini ekolu ($11.55) comes with three choices of meat, but the mini mixed plate ($6.85) or the regular mixed plate ($10.50) are typically enough for one hungry diner. Both the kalua pork and the teriyaki steak can be hit or miss. The pork is often over-salted despite its tenderness, but mixing it with the large portions of rice and macaroni salad helps even things out. Among the three meat options, I tend to favor the teriyaki steak—a flavorful pile of sliced beef that pairs well with the rice and macaroni. While Mo' Bettahs has nailed a menu that is simple and franchise-friendly, it's a strategy that also has a downside. If a ton of sliced, grilled, fried and pulled meat is right up your alley, then this place will be one of your favorite fast-casual joints around town. That's really Mo' Bettahs' only play—diners in search of more variety will want to scope out other pastures. That being said, there's nothing wrong with carving out a niche and sticking to your guns—it's catering to its audience remarkably well. I'm still trying to figure out why local law enforcement loves the place so much, though. Next time I get busted, I'll have to ask. Open: Mon.-Sat. 10:30 a.m.-9 p.m.